It is looking increasingly likely there will be stock shortages of Microsoft's new Xbox One console in the run up to Christmas this year. 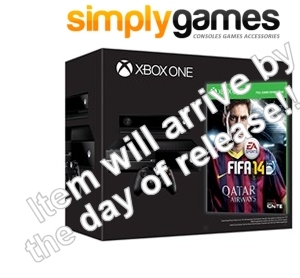 Nearly all UK retailers are no longer taking orders for the "Day One" Edition which included a free downloadable copy of either FIFA 14 or Forza 5. The only exception to this rule is currently Simply Games who still have "Day One" Consoles available for pre-order with the website quoting "Item will arrive by the day of release!!" It also indicates this version includes FIFA 14. GAME (Standard Edition) - £20 deposit required up front. Come the launch date of 22nd November, Microsoft has indicated they are currently holding inventory back so that there will be boxes on shelves for people to buy on the day. It's likely to be a ruck with queues around the block, but you still have slim hope of grabbing one early on if you never pre-ordered. Of course other shipments will be arriving before Christmas but with demand looking likely to be sky high it's a good idea to pre-order very soon whilst you still have the chance to avoid the stress of the inevitable stock shortages. The Stock Informer website will again be constantly tracking for availability to assist anyone looking for an Xbox One.